After my harrowing experience sharing the finer points of oil painting with a big bad cop on a narrow country road’s dangerous decent of a cliff face, I finished walking to the top of the steep grade and continued toward Liberty, New York. State Highway 52 brought me in on the east side of downtown Liberty, a fairly large spot on the map and more of a community than I really wanted to deal with. I was heading east anyway, toward a very little line going through the Catskill Mountains, so I turned to the right, picked up State Highway 55, and started walking toward less dense housing. At the same time I was considering how soon it would be dark. It was too close to a town to sleep beside the road, where late night fun-seekers might notice a vulnerable individual. And there was the rain that had been dogging me all day. With no tent, I needed a dry place to unroll my sleeping bag. The map did show a freeway overpass just east of Liberty and I had spent the day vaguely aiming for that structure, thinking there are bridges where freeways cross roads and it is dryer under a bridge than under the clouds. This substantial structure of modern transportation treated me better than I had hoped. 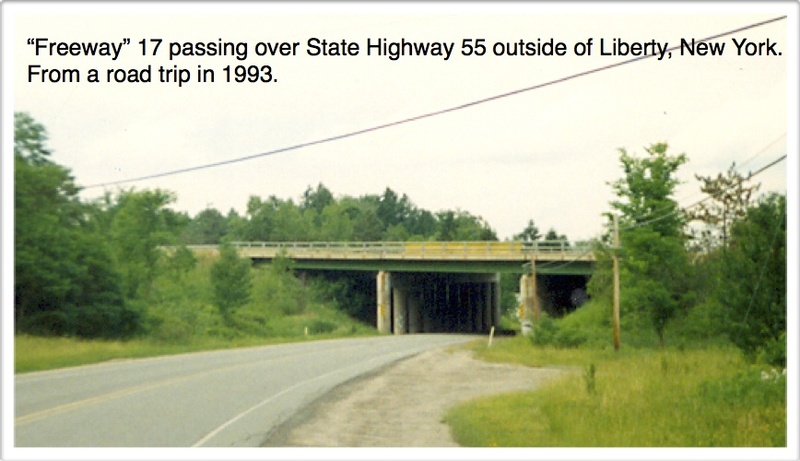 The freeway passed over Highway 55 and concrete slopes ran from the road up to the underside of the freeway bridge. I was glad see that at the top of these slopes were open spaces, about three feet high and some four feet deep, before the bridge abutments made walls supporting the freeway. Nice little flat shelves with roofs. They were ideal. Close enough under the bridge so the wind would not whip in rain. Deep enough so I’d be out of sight. And, while the cemented slopes were plenty steep, they were not impossible to scale. I checked to see that no vehicles were going to witness a bum climbing around under the bridge and scurried up the left slope, under the north side of the bridge. While the slope was covered with concrete the little shelf was not. After an initial disappointment that this ideal accommodation did not include nice soft padding and 1000 count Egyptian cotton sheets (it’s a joke — I was a hippie. How was I to know you can count threads in sheets? ), I quickly settled onto the loose gravel and dirt. Gravel and dirt that was softer than concrete and dry as moon dust. It was going to be a great night for sleep. This entry was posted in Hitchhiking and tagged dry, Liberty NY, overpass, safe on January 21, 2014 by deansgreatwahoo. So good to find a nice dry spot to sleep. No used toilet paper, poo, garbage, and other disagreeable things. What a trip. Reminds me of sleeping off the road beside the Mississippi. It was a good thing I didn’t know about the water moccasins back than. Well done Dean.